I love the Battlestar Galactica universe. It began as a somewhat campy television show that was nonetheless perfect for its time. As a little kid watching the show, I really loved it. Then a few years ago the series got rebooted as a much darker space drama, which again, was perfect for the time. The series was so dark, and so well loved, that its presence severely influenced most other sci-fi, and especially space-based, stories through today. There have been other games based on Battlestar Galactica, both videogames and board games. 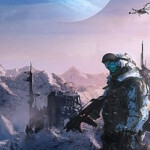 They run the gamut from acceptable to good, a few are great, and quite a few of them are overly complex – in the case of the board game at least. What made both television series so good, at least in large part, was the characters and their interactions with one another. But the ships were also the stars of the show, from the Colonial Vipers which fought dogfights in almost every episode, to the massive capital ship, Galactica, a sort of space-based aircraft carrier that gives the show its name. 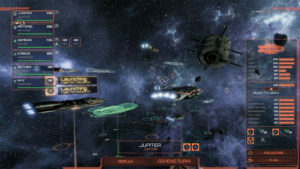 The Battlestar Galactica Deadlock game mostly removes characters from the equation, and focuses instead on the ships in a solid tactical simulation. 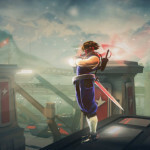 The game was originally released for the PC though the Steam Online service, and recently migrated to the Xbox One and PlayStation 4, where we pick it up for this review. Both shows focused on the plight of humanity trying to flee the robotic Cylons, robots that humans created, after most of the original twelve colonies are destroyed in a massive sneak attack. The last fleet basically spends years trying to find the mythical thirteenth colony, which happens to be Earth. But forget all of that, because Battlestar Galactica Deadlock focuses on the first Cylon war, when the robotic servants first rebelled, approximately 20 to 30 years before the television shows. Historically, humans won that war, but obviously didn’t completely wipe out the Cylons. In Battlestar Galactica Deadlock, you will be tasked with building, deploying and fighting with the colonial navy of spaceships. Each colony has its own forces as well, but don’t have a chance of beating the Cylons without your help. You build your ships using a giant floating shipyard, which can jump around with your main fleet and participate in battles. The shipyard adds several gun batteries to the battlefield, plus two squadrons of fighters, but results in a game over if it is destroyed. 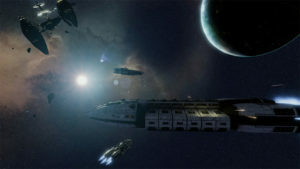 You can also build ships and merge them into supplementary defensive fleets, something you will need to do if you want to try and counter all of the Cylon incursions into Colonial space, but only the fleet with the shipyard attached can participate in story missions in the single player campaign. Command the fleet with a copy of Battlestar Galactica Deadlock from Amazon. Battles in the single player game are extremely tactical, and mostly fought with capital ships, though there are also Colonial vipers and Cylon raiders. You don’t start off with the Battlestars from the show, but instead smaller ships like corvettes, and prototype Battlestars like the Adamant class which house a single fighter wing. Eventually you can research new technologies for bigger and better ships, plus more advanced fighter designs, offensive missiles and defenses. 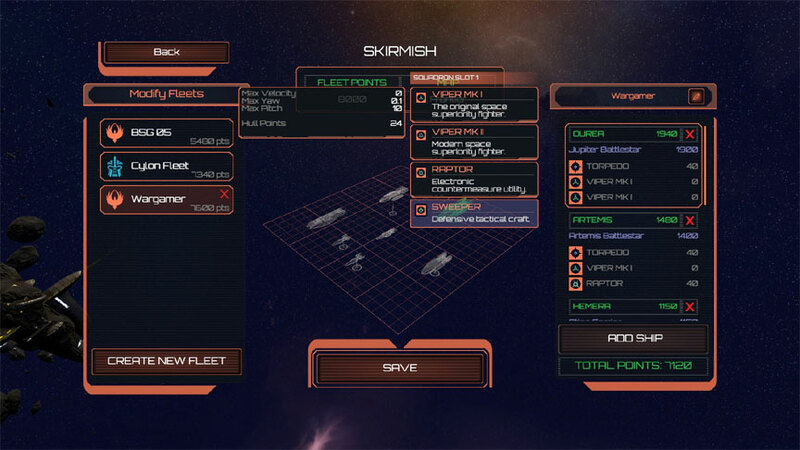 Each battle begins with lining up your ships in a small starter grid. Not only do you control the positions of the ships, but also their relative altitude. 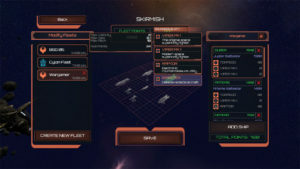 Smart commanders will want to assign ships to different relative heights, so they can maneuver and not hit each other. Ships will have different firing arcs, with larger Battlestars generally having powerful broadsides, and smaller units like corvettes having their guns mounted forward. Known enemy contacts that you have not scanned are represented by blips far away on the map. Generally, the Colonials will want to launch their fighters right away. Not only are the Vipers good at shredding most early Cylon fighters, they are also really fast. They can cover the distance between two fleets and unmask targets. This is important because the Colonials have banks of missiles – the Cylons do to – which need to be targeted. So, if the Vipers rush out and unmask the Cylon positions, you can send volleys of missiles at them and perhaps destroy some of their ships before they can target you and shoot back. Vipers can also be given defensive orders, tasked with protecting specific capital ships from enemy fighters or incoming munitions. 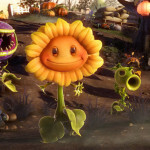 The game is played in turn-based real-time. 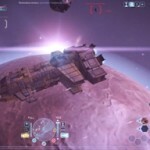 What happens is that you give your fleet orders while the game is paused, and when you are ready, you let them run off about ten seconds of real time. The game then re-pauses, and you can give new orders. As a strategy gamer, I have to say I really appreciate this interface, which lets commanders rely on good tactics and overall battle strategy instead of reaction times and button mashing. Too many potentially good wargames have been ruined because of not letting a player pause and think. In addition to the single player campaign, there is also a skirmish mode that lets you conduct wargames between Colonial fleets or even play as the Cylons. 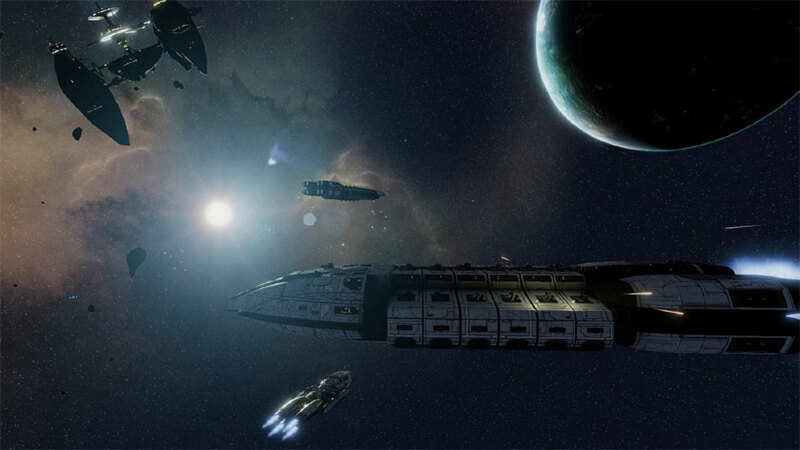 Battlestar Galactica Deadlock is far from perfect. It’s not a AAA title, and at times it shows. The tutorial is not that great, leaving players to figure out a lot of critical pieces of the infrastructure on their own. It’s not overly complicated, but seems so at first because key elements are not explained. Also, the game at times breaks. It did not crash on our PlayStation 4 review copy, but certain critical functions, like the ability to jump fleets or access intelligence, stopped working. Only a save and restore process reset everything. These were rare, but prevalent enough to deserve mention. 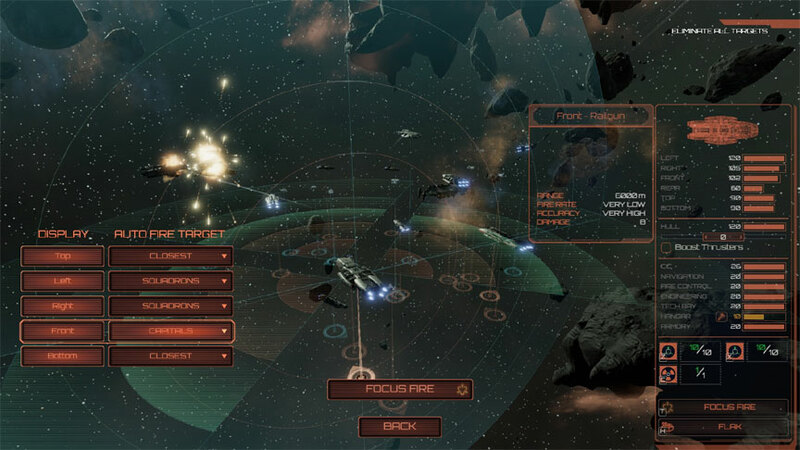 Fans of Battlestar Galactica will enjoy Battlestar Galactica Deadlock, but so will those who enjoy good tactical fleet combat in space. If players can get past a somewhat weak tutorial and figure out how the interface works, then the real fun of planning tactics and strategy for the Colonial fleet trying to save humanity can fully kick in. 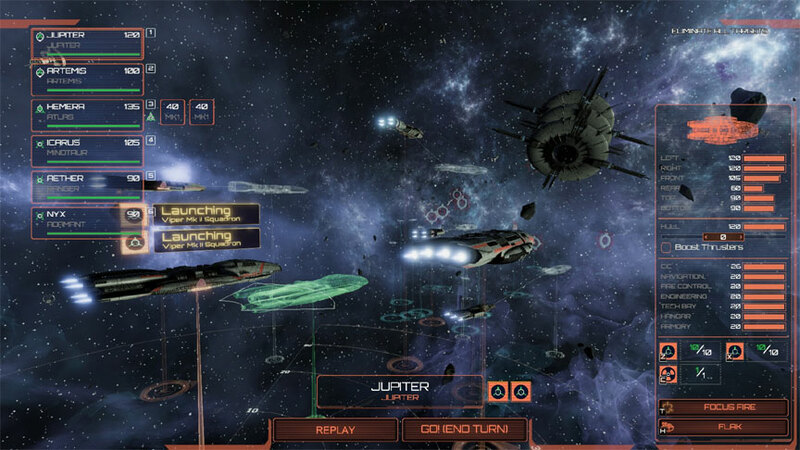 Battlestar Galactica Deadlock earns 4.5 GiN Gems for bringing us an engaging and beautiful-looking sci-fi tactical combat simulation for a budget price. 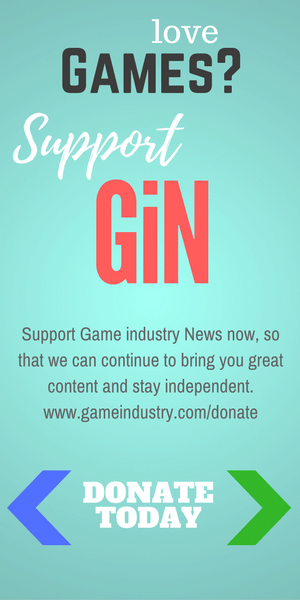 It’s a fun game that will earn a spot with any strategy gamer. So say we all!